We are offering Regular N.T. Skid Bowl to our clients. Our company has earned great laurels as manufacturers, wholesalers and suppliers of Marble Pet Bowl. 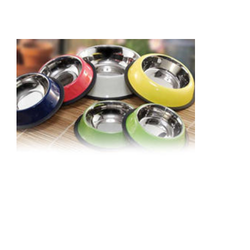 Best quality Steel pet Bowls are been manufactured of various sizes. Black coloured pet bowls are available. 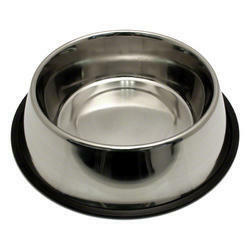 We offer a wide range of pet bowls is perfectly designed in a host of shapes and sizes to offer the pet full comfort. Known for their durability and superior finishes, these bowls are available in various sizes and designs at market leading prices. We are successfully engaged in providing a wide gamut of Dogs Bowl Stand. This Silicone Collapsing Pet Bowl is the perfect solution for your thirsty, Hungry pet when on the go! Each bowl, when flat, measures about 12.5cm in diameter and about 1cm in height. - A beautiful decorated plastic pet feeding bowl cat & dogs. - Weight : 65 Gm. - Size : 17 Cm.